Pre-requisites: Students must be enrolled in the Apothecarist medicine-making program to take the Internal Preparations class. All others are open enrollment, first-come, first-serve. Class limited to 15 students. These are 3-day long on-site intensives for students to have even greater depth of training in certain specialty areas. These are designed for apothecarists that would like to create a product line or specialize in a certain area of herbal preparations. The dates for these intensives, which will be dove-tailed against upcoming clinical on-site classes. Internal Herbal Preparations: This is a fun and collaborative course. 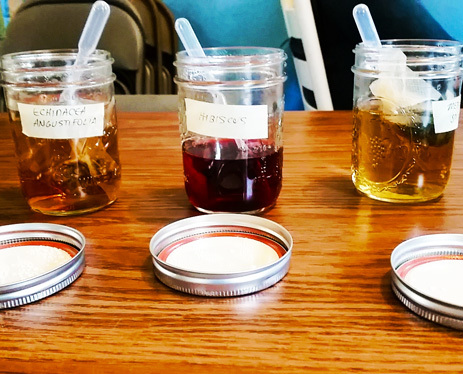 Students will get hands-on experience in making everything from herbal honeys, vinegars and gummies to experiencing a tincture tasting bar, concocting bitters, teas and tonics — all designed to be end products that apothecarists can market for purchase. Dates: November 18 – 20th, 2019.